Wonderful warm welcome, you must come here, even in the rain the welcome is warm and friendly, amazing food, good prices, and what's more, it makes the all inclusive package a distant memory, spend a little time to make this place a good stop off,you wont be disappointed. Beautiful setting fantastic view. Food was delicious. I had a lovely fresh greek salad. Staff very friendly and made a real fuss of my young daughter. Brilliant!!!! George was so nice and inviting Spaghetti Carbonara lovely! Brilliant 10 Stars!!! One day we asked for a seat by the edge of the boat, there were none but when someone finished we were moved great place! We ate twice here during a two week stay in August. On both occasions we had a starter. The first time we had one starter each (meat balls in sauce) but shared one the second time (fried cougettes) as the portions were very generous. For the main course we had a lamb dish which was cooked to perfection also the Kefalonian pie which again was a very large portion in comparision to previous helpings at other restaurants. The setting over looking the sea is a bonus, however it is right next to the main road so if you are placed at busy times on the road side this can be a bit of a distraction. Having said that we would return to Penelopes in the future. Lovely place, great food really nice staff and a wonderful setting. Is also great value. Would highly recommend. sorry, only just realised I didn't put ratings - it's top drawer. We always stay at Pelagos Bay and so this is always the place to eat on the first night (two minutes away). Got say though, we never only eat here once - you've just got to come back. Brilliant food and service. The staff are really good and Fatos is only too happy to make "Billy's Dish" for you which is a seafood pasta bowl - stunning. Only negative is that there were quite a few wasps around last year - but that was general, not just here. Really looking forward to eating here in a few weeks time - BRING IT ON!!! Jan & Graham from Hionata Kefalonia, in the holiday season we love to play being tourists, and Penelopes is one of our favourite restaurants in the Skala area, the waiter never asks what I would like, it's always Mussel Saganaki served in a frying pan washed down with a glass of red, we love the place and always take friends who stay with us, no complaints yet from anyone, roll on May. This is a beautiful restaurant and definitely worth a visit, just a short walk out of Skala, and set in a beautiful old ship on the side of the road overlooking the ocean, which is very romantic, and you will see a lovely sunset from there. Tried the roast lamb, it was a bit tough, but masses of meat. the kleftico also looked really good. The service is great here with a lovely atmosphere - diefinitely wort having a meal here. Food was very nice and location over looking the sea was nice - only downside is that on several occasions we turned up for lunch and they weren't serving food. This boat/restaurant is now called Penelopes. See my review under "Penelopes"
I believe this is the restaurant though on the till receipt it is shown as '7 Islands'. 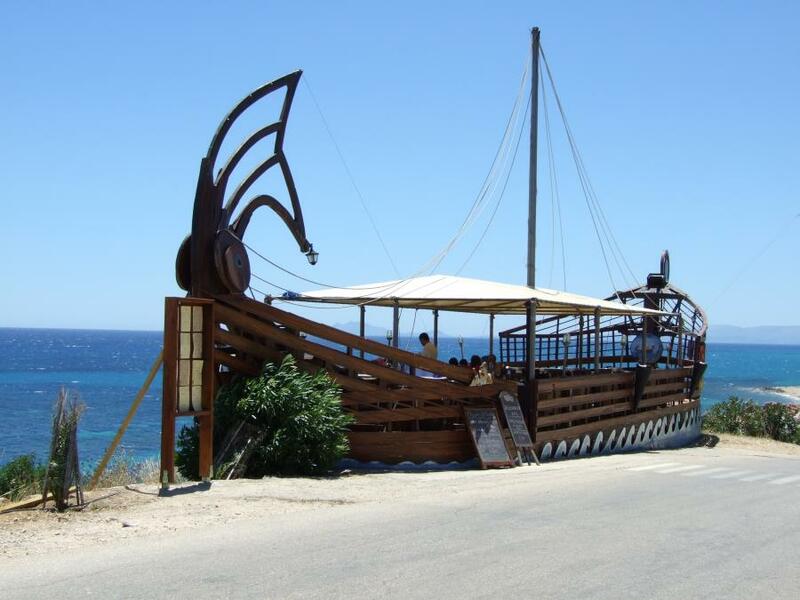 It is shaped like an old style boat and is on the top of the cliff about a mile out of Skala on the Skala to Poros Road. On the day we visited it was packed, though previous nights we had passed by and it was quiet. The service was not up to speed and they did not have our first choice. However the food was very good though. The Boat restaurant is situated on the coast road about 1-2 miles out of Skala near Pelagos Bay. The food was always of an excellent standard and the service always excellent also. Prices for Food and drink are very reasonable. I would definitely recommend the cheese pies as a starter and the mixed grill for two as a main course. If you are staying in Skala it is worth a visit to this excellent restaurant which boasts excellent views, friendly staff and reasonable prices. In my opinion it is one of the best restaurants in the resort even though it is a little out of town. If you visit ask for Fatos.